In the live-action web series Mythomania, Andy Go is a cartoonist who dreams of making a living off his work. 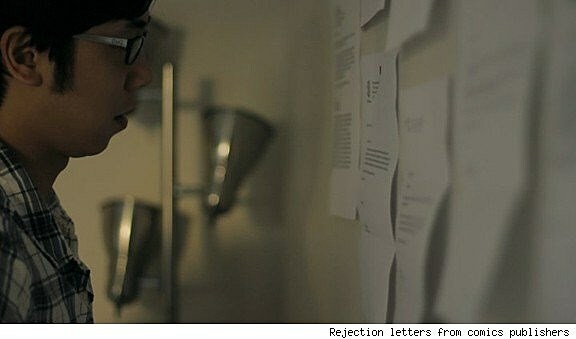 Unfortunately, while he may be accepting Eisner awards from comics legend Scott McCloud in his dreams, in the waking world his bedroom wall is papered with publisher rejection letters, and his friend circle is populated by sardonic weirdos who could probably be more supportive of his ambitions. Written and directed by Derek Kirk Kim, the Eisner-winning cartoonist behind Same Difference and Other Stories, The Eternal Smile (with Gene Luen Yang) and Good As Lily (with Jesse Hamm), the first season of Mythomania was a cute slice-of-life tale from the world of indie comics that got funnier and more sophisticated with each episode. Now ready for more, Kim has taken to the Kickstarter platform to solicit funds for the second season of Mythomania. There are many web-series about comics, geek culture and so forth (such as the comics shop-based comedy The Variants, which has featured frequent ComicsAlliance contributors Curt Franklin and Chris Haley, and will also be returning for a new season thanks to Kickstarter). The ones I've seen are often really funny but also, I think, quite eccentric. I'm hardly an expert on the web series scene, but what made the first season of Mythomania stand out to me was how true-to-life and personal it was. The show follows Andy as he endures the defeats and sacrifices suffered by those who seek their fortunes in the comic book book business, and it's funny but also quite sad. Kim spoke to that dimension of Mythomania on the project's Kickstarter page. "As much as I love the comics medium, the incredible solitary nature of its process is something I've come to dread," he said. "In fact one of the aspects of comics-making that I specifically wanted to explore in Mythomania was the toll the medium's monumental demands at the drawing board can take on a cartoonist's psyche and social life. There's refreshing irony then in depicting it in the most gregarious storytelling medium of all -- film." "I'm not selling DVDs. Just like your local NPR station isn't selling tote bags for a $100. They're not selling tote bags, they're asking listeners to fund programming. 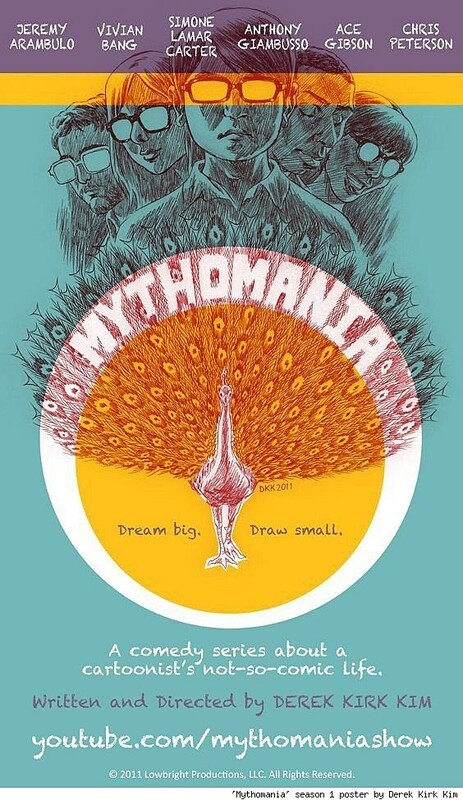 "Mythomania is an internet show. The 'goods' here that people would be investing in is just that, an online show. The perks are just that, perks, not what the donation is really going toward. If I donate to NPR, I expect more on-air programming, not a CD with all that programming recorded on it. The totebag sure it a nice bonus on top of it though!" Kim added, "Here's something to keep in mind. The cost of producing and shipping the prizes comes out of the donations. Not much of the donated amount could go toward what the fund raising is actually for, making more episodes, if all of it was spent on the prizes. Believe me, I really wish I could give out awesome physical prizes at small donations, I'm so thankful and grateful for any few bucks someone might want to throw my way. I know what a tough economic time we're in so I'm totally honored if anyone donates anything. It's just not financially feasible, if more episodes are to be produced, which I like to think is what most donors really want out of this Kickstarter." I think Mythomania is a funny and very honest window into what life can be like for cartoonists, and how randomly one can face not only rejection but also opportunity. There's a plot line in the first season that features a performance by Jason Shiga (Bookhunter, Empire State) that's really hilarious, and I hope to see more of the show soon. You can learn more about the project ont he Mythomania Kickstarter page. Click here to watch the first season of Mythomania.